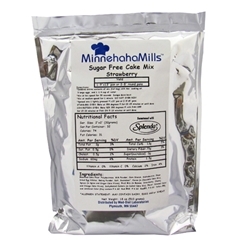 Our Minnehaha Mills sucralose sweetened, chef-designed sugar free cake mixes come in 15 delicious flavors. Just add water, eggs, and oil. Spread onto 1 lightly greased 9"x 13" pan or 2 lightly greased 8"x8" pans. Ingredients: Bleached Wheat Flour, Polydextrose, Maltodextrin, Non-Fat Milk Powder, Modified Food Starch, Fiber, Dried Egg Whites, Baking Powder (Sodium Acid Pyrophosphate, Sodium Bicarbonate, Corn Starch, Monocalcium Phosphate), Potato Starch, Tapioca Dextrin, Xanthan Gum, Sea Salt (Magnesium Carbonate), Natural & Artificial Flavors (Dextrose, Corn Starch, Less Than 1% Turmeric, Less Than 1% Apo Carotenal, Alcohol), Baking Soda, Sucralose Natural & Artificial Color (may contain Yellow #5, Red #40).